A “Scotch Bonnet” burger described by judges as “delicious, healthy and very Scottish” has lifted the top award in a “Commonwealth Burger” competition run by Quality Meat Scotland (QMS). The three finalists in the nationwide competition battled it out at the Royal Highland Show today with the standard of all three burgers summed up by judges as extremely high. BBC’s The Voice contestant, Max Murphy, also British Judo Champion, announced the overall winner from 12 year old Eve Cattanach (12) from St Mungo’s High School in Falkirk. Eve’s Scotch Bonnet burger contains lean Scotch Beef mince, Scottish free range egg, Scottish cheddar cheese and Scotch Bonnet chilli. Another ingredient which caught the judges’ eye was Porridge Oats. After working with local Scotch Butchers Club butcher Rod Gillie from Thomas Johnston in Falkirk to refine her final recipe, Eve beat off tough competition from her fellow finalists Hannah Riddell from Dornoch Academy in Sutherland and Cameron Tweedie, Cameron McGlade and Haydn Evans from Cedarbank School in Livingston to win a once in a lifetime opportunity for any budding young chef. In addition to her burger being sold in Scotch Butchers Club member shops across the country in the run up to the Commonwealth Games, her school will also receive a £250 voucher to spend on delicious Scotch Beef and Lamb PGI as well as Specially Selected Pork. 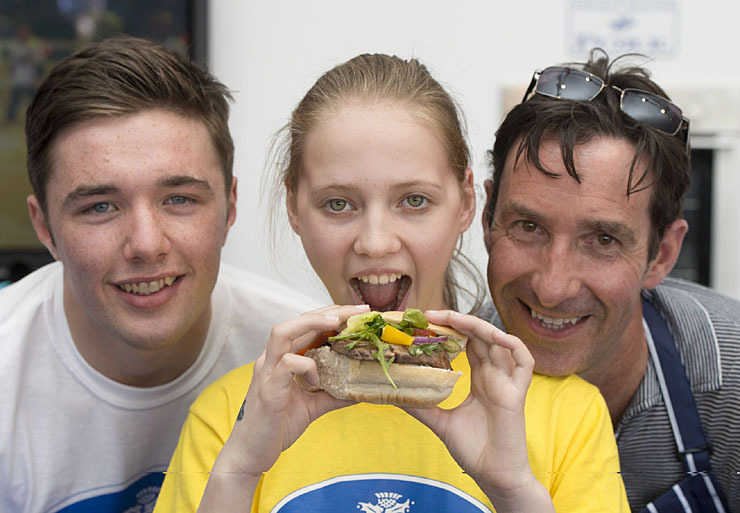 Scottish schools were invited to participate in the challenge which involved the children creating a delicious burger incorporating a Commonwealth twist using naturally produced Scotch Beef PGI, Scotch Lamb PGI and/or Specially Selected Pork. A shortlist of schools then worked with their local Scotch Butchers Club butcher to perfect their final recipes before the three finalists were chosen. The three finalists were shortlisted from 295 entries from 40 schools and attended the live final at the iconic Royal Highland Show in Ingliston where their burgers were prepared by their partner Scotch Butchers Club butchers before being tested by the judging panel which included Max and a selection of industry experts. Max, who also performed live on the QMS stand, praised the high standard of entries: “I am proud to be involved in such a fantastic competition which encourages young people in Scotland to take an interest in healthy eating. As a judo player I know the importance of a healthy and balanced diet and I think it’s great that pupils are learning more about this from a young age. Jennifer Robertson, health and education coordinator at QMS said: “The competition provided a fun and entertaining opportunity to raise awareness of healthy eating and encourage the pupils to take a more active role in the kitchen, learning how to prepare and cook meat from scratch. The assistance of our partner Scotch Butchers Club butchers was invaluable and they worked with the pupils to develop their recipes and think about what makes a product popular with customers. Eve’s Scotch Bonnet burger was inspired by the passion of professional athletes and the ‘fire in their bellies’ at the start of a race. Her burger combined Scotch Beef, chilli, porridge oats, mustard, garlic and Scottish cheddar.